Home News WATCH: Pacquiao to Trillanes: "Good thing I have Jesus in my life or else, I will punch Trillanes"
WATCH: Pacquiao to Trillanes: "Good thing I have Jesus in my life or else, I will punch Trillanes"
Senator Manny Pacquiao took offense to the statement of senator Antonio Trillanes IV against the other senators who lectured retired SPO3 Arturo Lascañas about spiritual renewal during the hearing of the Senate committee on public order and dngerous drugs last monday. In his speech on Wednesday, senator Pacquiao said he was offended by the statement of senator Trillanes that like some of the other senator, the retired cop did not also become a saint after his spiritual renewal. He believed that Trillanes has the right to give his opinion, but he asked to not give a bad name to his colleagues. “As senators, we are not imposing our morals on our resource persons. And for the record, I’m not imposing my morals on SPO3 Lascañas. I (was) just offended, Madam President, by the statement of my colleague, Senator Trillanes.” Pacquiao said. 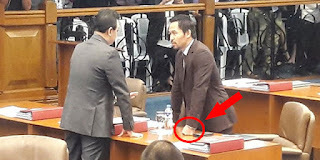 Pacquiao was insulted by the statement of Senator Antonio Trillanes, because it appeared that he was a “fake” christian. He even said that if he was not a christian, he may already assaulted Trillanes inside the senate hall. “Para bang hindi ako totoong tao, para bang yung pagiging Christian ko e fake. That’s my understanding, Madam President, and that’s very offended to me. Good thing that I have Jesus in my life or else I will run to his chair and then hit him right away …,” Pacquiao said. Trillanes stood up on the floor after the speech of Pacquiao and clarified that his recent statements were not for the boxing champ turned senator. “Dun sa article na ‘yun, walang pangalan doon eh kasi marami, hindi lang naman si Senator Pacquiao ang nagmention about spiritual renewal,” he said. Trillanes then apologized to senator Pacquiao for his remarks. Let me apologize to Senator Pacquiao if he was offended by the statements I made to the media but let me assure you, hindi talaga ganun ang intensyon,” Trillanes said. Lascañas, during the senate inquiry was lectured by the other senators about the spiritual renewal after the retired cop claimed that a child-like image appeared in his dream and saved him from the devil. One of the senators who questioned the legitimacy of the spiritual renewal of Lascañas was senator Pacquiao.